Rifton Multi Desk Wheelchair Desks are convenient and easy to use. The ease in adjusting these desks allows them to serve as “custom” desks for wheelchair bound children. These wheelchair accessible desks are perfect for inclusion of disabled children in a regular classroom. The option for a flat or tilt surface allows you to choose what best suites your child’s/ student’s needs and ensure optimum comfort. Birch plywood rectangular tabletop with a semi-circle cutout to allow for positioning of child. Legs are adjustable without tools. Double laminated tabletop makes desk warp resistant and strong. Desktop angle adjusts safely and quickly, 5 degrees at a time, up to 30 degrees. Double-latching mechanism for safe adjustments. Book ledge prevents items from sliding off when desktop is tilted. Open-top book box attaches to side of Multi Desk serving as a personal bookshelf for easy storage and easy access. 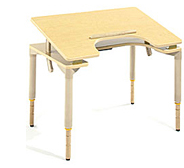 Maple Snap-on Edges snap on to Multi Desk (without tools) when physical or visual boundaries are needed. Use this Dimensions Chart to help you make the right choice of wheelchair desk for your child. Text and images courtesy of Rifton Equipment. Copyright ©2012. Used by permission.